Lofts 14 in Logan Circle is a case study in successful adaptive reuse development. Church Street in this eclectic Washington DC neighborhood was once known for its houses of worship before turning to auto body shops and other commercial buildings. But the most recent incarnation has seen those industrial spaces transition to hipster modern living. 1401 Church Street NW in Washington DC’s 20005 zip code was originally an auto showroom but the CallisonRTKL architectural firm added another story and completely restructured the rest, ending with a contemporary six-level building with giant showroom windows at the ground floor and super big windows on the other stories as well. 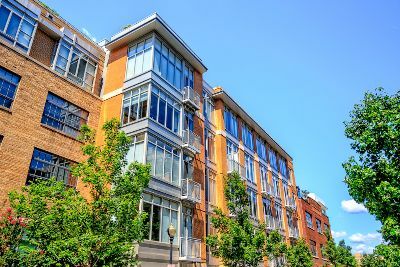 Delivered to market in 2005, Loft 14 quickly became one of Logan Circle’s most popular and talked about condominiums. This particular complex is also commonly referred to as Lofts 14 I (one), with 84 units. It is accompanied by a second condominium located directly across the street at 1400 Church Street NW, known as Lofts 14 II (two). The second component was delivered the same year with 37 luxury residences. Visitors to the Lofts 14 1 contemporary space will find a sleek lobby with soaring ceilings, mosaic tile walls and a 24/7 staffed front desk with concierge service. Progressing further into the building reveals an intriguing blend of the original structure and added elements, such as old exposed brick juxtaposed with overhead steel girders and new custom finishes. The second Lofts 14 across the street also features modern industrial-style elements. The units themselves continue the interesting combining of styles. Exposed brick, concrete and overhead ductwork may exist in places while other sections are big on stark white minimalism and glass brick walls that serve as room dividers. Flooring comes in either bamboo or other appealing hardwoods, while the giant factory-style windows and outside private spaces add to the inviting ambiance. The open space kitchens are also a delight, offered in a variety of different and including exotic wood cabinets, stainless steel appliances and granite counters. Residents at these pet-friendly buildings also enjoy secure parking, a bike room, doorman and a wonderful common roof deck. And those fortunate enough to own a penthouse residence will have their own private rooftop sanctuary. Condos for sale at Lofts 14 have recently been listing between $424,900 and $1.775 million. The neighborhood location is also a big selling point with amazing amenities all around. Lofts 14 is in the Logan Circle Historic District and residents can stroll a couple blocks to the Logan Circle Park inside the traffic circle itself. There is also a great farmer’s market plus Trader Joe’s, Whole Foods, Studio Theatre and numerous yoga studios. But perhaps the best perk is the proximity to some of the best bars and restaurants in the District. Lofts 14 is just steps from 14th Street, with Church Key, Le Diplomate, Drafting Table, Pearl Dive Oyster Palace, Black Jack (above Pearl Dive) and way too many more to mention. There are also a number of nearby Metro stations. There are tons of great lofts for sale in Washington DC. But Lofts 14 has certainly made a name for itself.